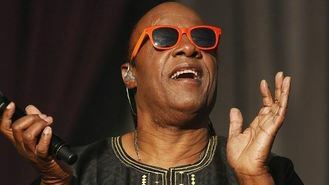 Stevie Wonder has paid tribute to soul star Bobby Womack, as he closed the Calling Festival in London. The 64-year-old American singer, the headlining act on the final night of the two-day event at Clapham Common, performed a cover of If You Think You're Lonely Now with his backing singer in honour of his late friend, who died on June 27 at the age of 70. Stevie said: "It's always a painful thing when we lose someone in this industry, but each time we lose someone, we can say we are left with their musical history. I saw him last right here in England. "I want to give my condolences to his family and hope that he is in the best place spiritually. Please give a hand to Bobby Womack!" Stevie, who previously headlined the Calling Festival - formerly known as Hard Rock Calling - in 2010, reminded Londoners of his star status with his two-hour-long set. Defying the murky weather, the Superstition hitmaker had fans smiling as he said: "Love has everything to do with the weather." With Mother Nature on their side, fans were immediately singing along as he opened up with a cover of Marvin Gaye's How Sweet It Is To Be Loved By You and Master Blaster (Jammin). He said: "I would love to be here all night if I could." Stevie led the 50,000-strong crowd in a huge singalong of Ebony And Ivory and Part Time Lover before whipping them into a frenzy with a sequence of his greatest hits, including Signed, Sealed, Delivered, Sir Duke and I Wish. He even entertained the crowd with a mockney accent, calling himself a "Stevie Wonder impersonator", before launching into My Cherie Amour. Aerosmith guitarist Joe Perry, who topped the bill with the group on Saturday, made a surprise appearance as Stevie finished the evening with his biggest hit, Superstition. Stevie's performance was the highlight of the final day of the festival, which was partnered by Absolute Radio. Earlier acts included Michael Kiwanuka, Paloma Faith and Jack Johnson, who said: "If someone had said I'd be opening for Stevie Wonder one day..." as he shook his head in disbelief. The Who's frontman Roger Daltrey has criticised gig-goers who spend their time at gigs engrossed in using their mobile devices phones rather than actually watching the show. The Horrors frontman Faris Badwan has said he has a deep admiration for Dolly Parton and couldn't wait to see her at Glastonbury. Rock veterans The Who have announced a series of 50th anniversary shows - and suggested it would be their last major tour by telling fans it was the start of their "long goodbye". Pharrell Williams, Lionel Richie and Nicki Minaj were among the big winners at the BET Awards. Lionel Richie has revealed how his grandchildren have helped him come to terms with ageing, as he was honoured with a lifetime achievement award at a glittering ceremony. Ed Sheeran has trumped Coldplay with a swift rise to the top of the albums chart. Country queen Dolly Parton ruled Glastonbury as she attracted the biggest crowd of the festival to the Pyramid Stage. Dolly Parton said has said she is "just a country girl" but now feels "like a rock star" ahead of her much-anticipated set at Glastonbury.